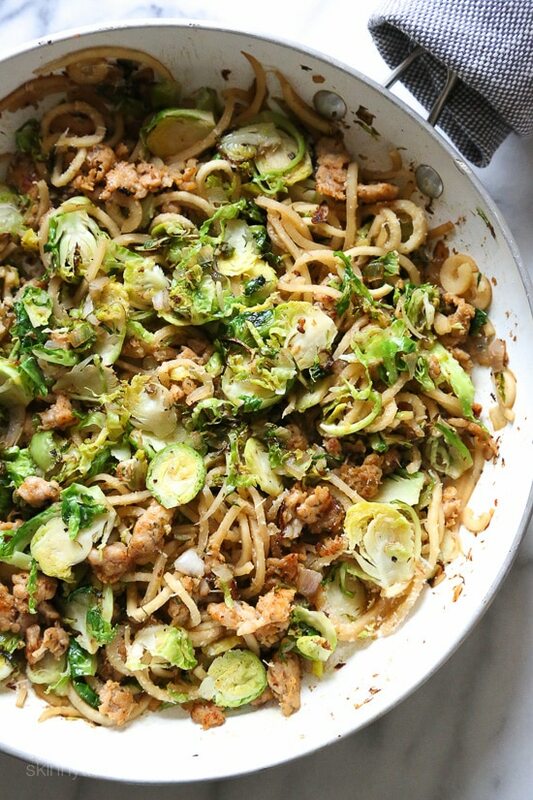 Spiralized parsnips make a wonderful pasta replacement in this satisfying, spicy Autumn dish made with brussels sprouts and spicy chicken sausage. Other spiralized recipes I love are Quick Spiralized Zucchini and Grape Tomatoes, Spiralized Mediterranean Beet and Feta Skillet Bake, and Spiralized Veggie Gratin. Working hard on my next cookbook so I am sharing some recipes from the archives! Inspired by this Broccoli Rabe and Sausage Parsnip Spiralized Pasta recipe, I’ve been craving more dishes with spiralized parsnips. Crazy how a vegetable I normally wouldn’t eat can be incorporated into a meal and taste so good! The bite of the parsnips pair wonderfully with spicy sausage. Add charred shaved brussels, pecornino romano and more red pepper flakes and this dish, loaded with veggies is a winner! 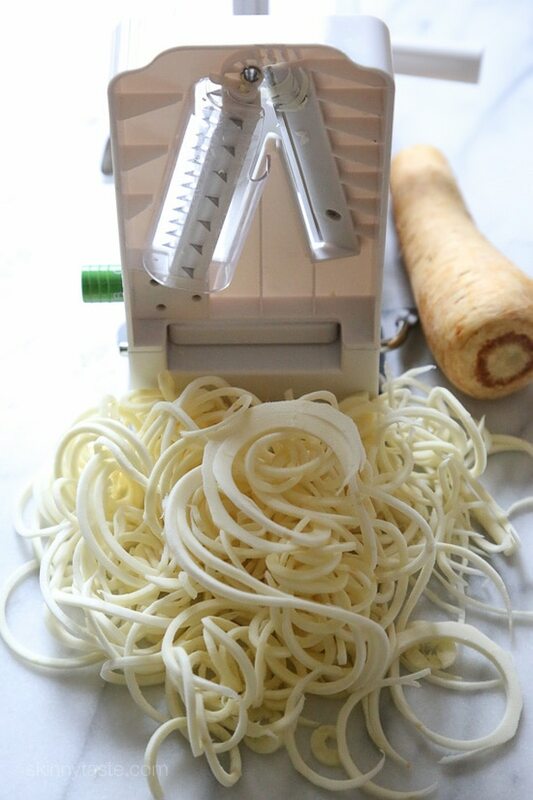 I highly recommend this spiralizer it’s the best (pictured above)! Place a large nonstick skillet over medium heat. When hot, add the sausage and cook, breaking up with a wooden spoon 6 to 8 minutes, until browned. Transfer to a plate. Add the oil to the skillet, brussels sprouts, shallots and garlic and cook on medium-high until golden on the edges, 4-5 minutes. Set aside with the sausage. Add the parsnip noodles to the skillet over medium heat with the broth and red pepper flakes and cook until the noodles are al dente, about 5 minutes. 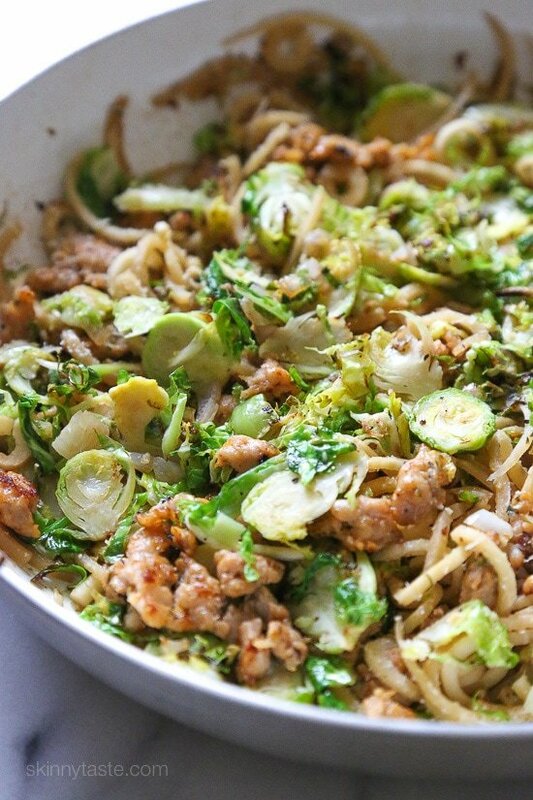 Return the sausage and brussels to the skillet, add the cheese and stir to combine. Made this for dinner tonight and it was fantastic. I just used gluten free pasta since I don’t have a spiralizer. Also used 2 precooked Italian chicken sausage links and cut them into small discs. Except for doubling the cheese, I didn’t change or add any anything else. It will def be moved into regular rotation (along with several of your other recipes). I made this for dinner last night. It was good, but not a crowd pleaser. In fairness, my crowd is 11 and 7. But being the frugal momma I am, I saved the leftovers. This morning I sizzled it up in a land and topped it with two fried eggs. OMG! Awesome! This was delicious! Excellent flavor with not many ingredients. Parsnips were hard to spiraliize with my cheap hand-twist one so I just grated them with my food processor. I will definitely make this again! Not a very attractive dish with the pale colors. I think it would be a great side dish minus the sausage. This was SO good and SO easy! I thought for sure it wouldn’t be filling enough for my husband, but it was the perfect amount. I was nervous about using the spiralized veggies because I could never really get into spaghetti squash. I couldn’t find parsnip so I used butternut squash and it was really incredible. This one will definitely be going into the dinner rotation! Thank you Gina!! On Whole30 and made this tonight. DELICIOUS! We used the Aidells chicken apple sausage that is Whole 30 approved, which is sweeter, so added a little extra pepper to make it spicier. Next time I may try and make my own chicken sausage. Doubled the recipe and excited for the lunch leftovers tomorrow! My boyfriend who is begrudgingly doing Whole30 with me said this was his favorite dinner so far! Not my favorite, but I did add too much salt. Might have been edible otherwise. Also I’m not the biggest fan of Italian sausage in this recipe. I used Trader Joe’s spicy chicken Italian sausage. I really wanted to like this. I even doubled the recipe so I’d have leftovers. I kept trying to think of what I could do to save this, but in the end, I threw it out. Made this last night for dinner and I have to say, it was not our favorite Skinnytaste recipe. It sort of tasted like diet food…which is not normally the case with Gina’s recipes! It all had the same texture (kinda mushy) and was just missing something. My husband and I are both pretty experienced cooks, and we couldn’t figure out an easy fix. Have to say I won’t be making this one again…but there’s lots of other good stuff on this site to try! I just cooked this tonight and unfortunately had the same result as you. In the end it’s sort of a mushy mash of all the ingredients… it tastes okay, and I feel good knowing it’s pretty healthy, but probably won’t repeat. It looked pretty decent up until the parsnip noodles which just ended up a little wet and sloppy. Oh well… I’ve made countless other recipes from this site and they’ve all been total knockouts! Wasn’t sure how many ounces of sausage to use so I ended up doing a meatier portion and I used 8. I used a fair amount of red pepper as I like my food spicy. I wasn’t sure how i felt about parsnips but wanted to try something out of the box- it was delicious! I actually made this into 3 servings due to how much sausage I used and was happily full when I finished dinner- can’t wait for the leftovers- another great dish to add to my list- this will be great throughout the fall and winter. Thanks!! Made this for dinner last night. It looked like Thai food when I was finished and I got real excited because I love Thai food! Well…….it didn’t taste like Thai food HOWEVER I used your amazing recipe for gochujang salmon and put a few of those ingredients in it. Thank you so much for introducing me to such amazing meals! I LOVE your stuff. I hope you get an app soon! Gina, I made this last week and am making it again tonight. What a delicious combination of flavors! I hadn’t spiralized parsnips before, and they’re so good! Nicely sweet, perfect texture. Thank you! I made this last night and it tasted great! I used turkey sausage because that was all my store had, they must be getting ready for thanksgiving! Although the actual cooking is quick, it took me forever to do the spiralizing because It was my first time using it. Definitely worth the extra effort. Is the chicken sausage you buy pre-cooked or uncooked sausage links? Gina! Girl, this is the best recipe ever! 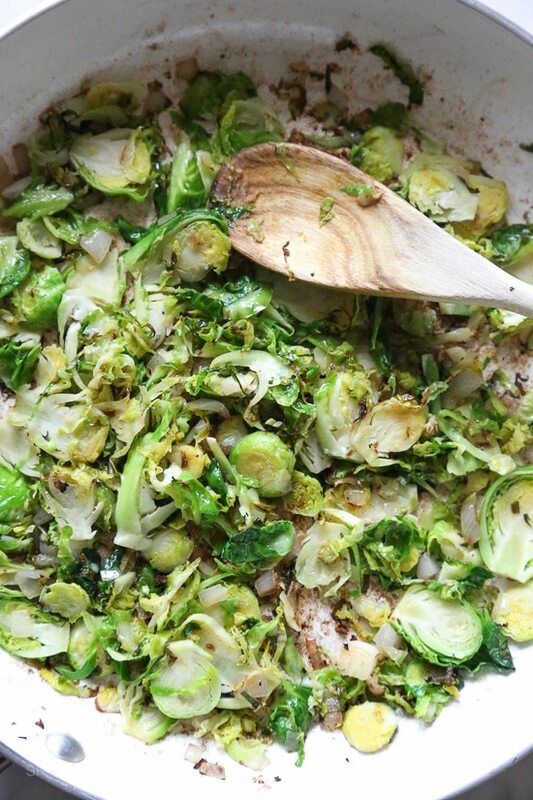 My daughter hates Brussel sprouts and she loved every thing about this dish! 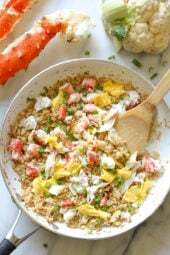 The flavors beautifully go together with the spice and the crispiness of the parsnips! Good job as always Gina and thank you again for all your fabulous recipes! I made this Friday night and my husband and I loved it! It’s easy to make and delicious with just the right amount of heat from the red pepper flakes. The serving size is very generous which I always appreciate, as well. Thanks for another great recipe, Gina! Do you think this would be good with butternut squash noodles? How do you think this would work with ground lean hamburger?? Just made and my husband already has said – VVG! Thanks so much for another fantastic recipe, Gina! Another winner, as I’m 2 years post-op from weight loss surgery and I cook a few of your recipes on Sunday’s for lunches all week. can I use zoodles instead of parsnip noodles? how would that change the recipe, if at all? I am not getting parsnips at my local store. No way does that go together, are you pregnant? I want to make your brussell sprouts, sausage, parsnip spriralized pasta dish. What brand of spiralizer are you using? How long does this keep for? Are leftovers okay, or better to eat right after cooking? Do you know what the smartpoints would be if cheese was omitted? Thanks!!! Regular size (not breakfast size). I subbed ditalini for the “pasta” and it was fabulous! I think I will add even more brussel sprouts next time. Very good! I made this last night and everyone enjoyed it. I couldn’t get my parsnips to stay in long “noodles”, they kept breaking. But it didn’t really matter in the end! It tasted great. Definitely a keeper, thank you. When do you add the 1/4 tsp salt? You can add it when you add the pepper, I salt as I go. I just made this for diner tonight and used a combination of both Brussels sprouts and broccoli rabe…it was so delicious!! Thank you for all your wonderful recipes. I’m an aussie and I’m not sure what you mean by “2 links” of chicken sausage… What exactly is two links? Do you know how much that would roughly weigh? Or is it just two sausages? This is a great recipe, thanks so much. I was fortunate to find nice fat parsnips, a must for spiralizing. Several people have asked that you clarify the quantity of sausage. Links vary in size across brands and WW points will be very sensitive to the quantity of sausage. Will you please respond? I made this last night and it was delicious! The key is definitely to find parsnips that are thick. I ended up spiralizing four of them to get enough noodles. Nice recipe Gina! I used spaghetti squash instead of parsnip and it came out great! The sausage gave so much flavor that I don’t even think it needed the Parmesan cheese. I’m so glad that this recipe is low carb and so filling. My husband is diabetic and I’m always on the hunt for easy delicious meals that are satisfying. Thanks! Oh this looks amazing! I cannot wait to try this! 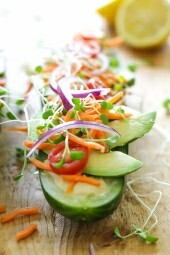 I love this blog and really appreciate the addition of smart points to your recipes! Thank you, it’s very helpful and makes following your recipes so much easier for me, a WW member. I use bulk chicken sausage from Whole Foods…can you tell me how much in weight I should use..vs links? 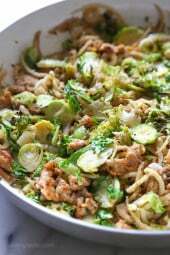 I absolutely LOVE your Brussel Sprouts Carbonara, so I will definitely be trying this! Thanks so much for all the fantastic recipes! 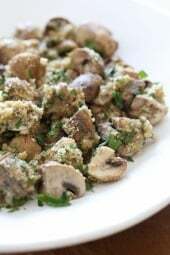 1/4 cup grated parmesan cheese (omit for whole30) <======This is my query ! Whole 30 is a meal plan on which cheese is not permitted. I bought this spiralizer and cannot get it to do sweet potoatoes. It doesn’t seem strong enough. Any tips? 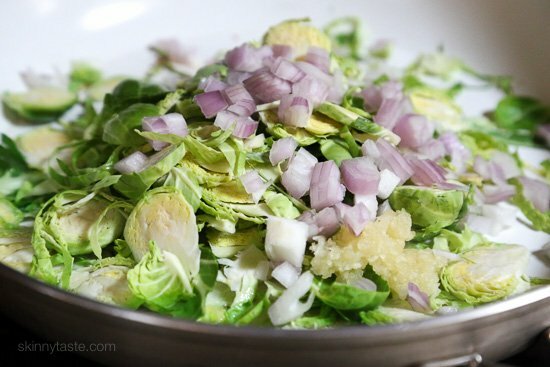 This might be a silly question, but how are you shaving the brussel sprouts? Do you buy them that way, or just slice them thinly? If you have a food processor you can also run them through them with the slicing blade on! Super quick work of it! Looks so good! If we don’t get the hurricane (models are looking promising for Virginia), then I will get the ingredients and make it this weekend! I was wondering about this, too. The weight varies from store to store. Gina, can you help? Check Asian super markets. They almost always have them. Hi Gina! Looks fantastic! In step 1, oregano is mentioned, but it’s not listed in the ingredients. Could you tell me if you added dried or fresh oregano and how much? Thanks so much! I eagerly await your newest cookbook that I’ve had on order!! I’m sorry will fix. I didn’t use oregano but you can!